South Africa has been ranked the world’s 53rd most innovative country, and the 3rd most innovative in Africa. The Global Innovation Index co-published by Cornell University, INSEAD, and the World Intellectual Property Organization (WIPO) revealed that Switzerland remains the most innovative nation in the world. The index covers 143 economies around the world and uses 81 indicators across a range of themes, with a focus on the “human factor” in innovation. “The importance of both individual and collective efforts of creators and scientists in the innovation process has been well documented in the literature,” the group said. The index focuses on two sub-indices which track Innovation Input and Innovation Output. 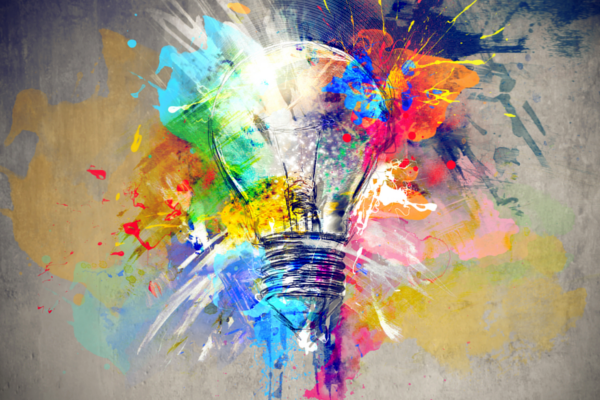 Innovation input looks at factors including institutions, human capital and research, infrastructure, market sophistication, and business sophistication – while innovation output measures both knowledge and technology outputs and creative outputs. 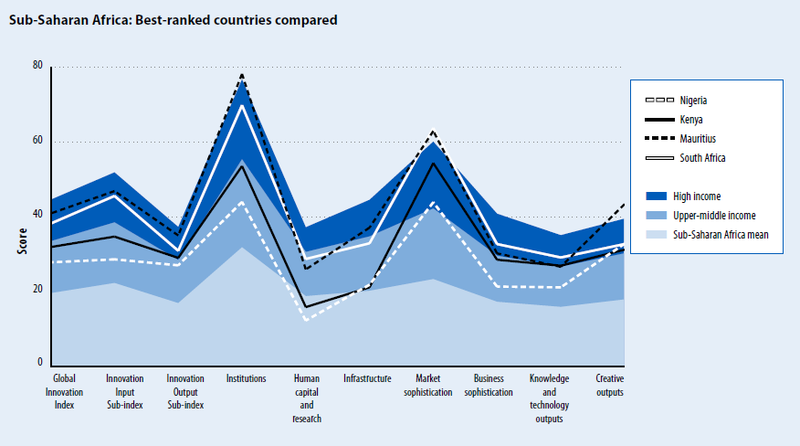 South Africa’s scores show it is relatively strong in Institutions (44th), Knowledge and technology outputs (62nd), Business sophistication (68th), and Creative outputs (70th). Its greatest strength is in the Market sophistication pillar (18th), with a score that is above the average performance of high-income economies. The country’s performance is below par in Infrastructure (84th) and Human capital and research (70th). 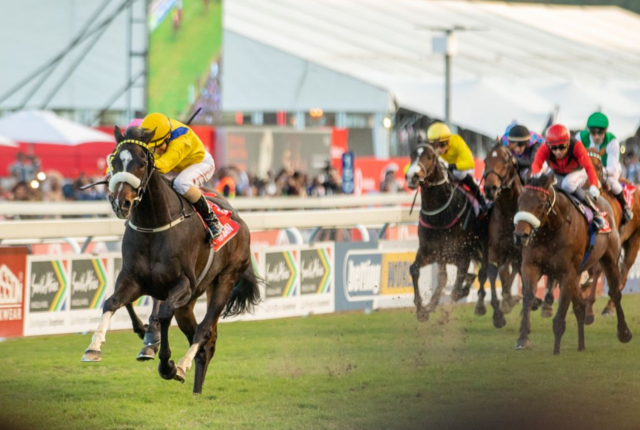 South Africa has also been in the top half of the rankings in all previous editions of the GII, and is 53rd in 2014 (up from 58th in 2013). “This year, however, a new Sub-Saharan African county has been included in the GII rankings: Seychelles, 51st in its first year in the index, is the third Sub-Saharan African country to be placed in the upper half of the GII rankings,” the group said. Among the BRICS (Brazil, Russia, India, China, and South Africa), four improved their positions. Brazil by three places to reach the 61st rank, the Russian Federation by 13 places to reach 49th, China by six places to reach 29th, and South Africa by five places to reach 53rd. India, on the other hand, has continued to slip by a further 10 places, dropping to 76th position this year. “Most of the BRICS economies are also showing other signs of progress,” the report said. South Africa’s innovation efficiency score fell under the average, at 0.68. According to the report, South Africa’s capacity for innovation is negatively impacted by the country’s inability to keep inventors in the country, or draw innovative thinkers to its shores. 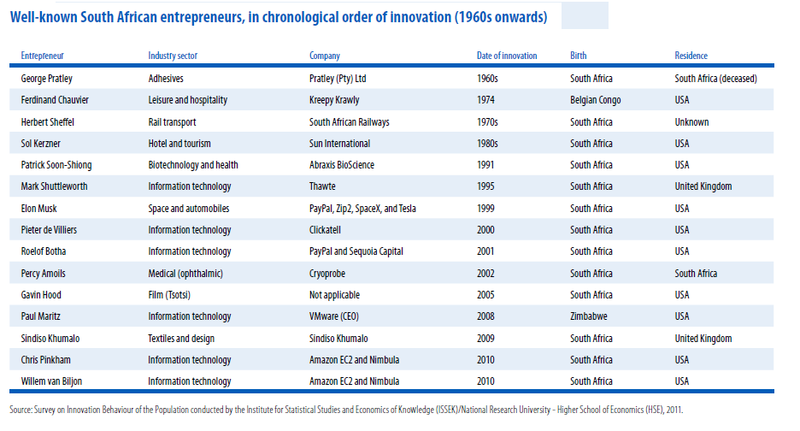 The report notes that, of the best-known innovators to come from South Africa, only one remains in the country itself. “Although South Africa has an impressive reputation for Nobel recipients and entrepreneurs — including the 2013 laureate Michael Levitt and the USA-based space entrepreneur Elon Musk — it has not been successful in retaining this talent and providing longer-term career opportunities,” the report said. This pattern of innovators leaving – a brain drain – has resulted in South Africa having a net loss of inventors between 2001 and 2010. The reports estimates that South Africa’s failure to retain the top 5% of researchers and entrepreneurs slices 20% from its potential innovation output. Is South Africa a fragile State?